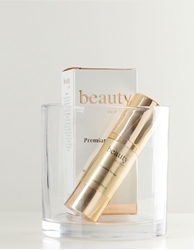 Daily Flawless - age defying serum. It is a rapid-absorption formulation that contains PhytoCellTec Malus Domestica (Apple Stem Cell) and green tea extract that helps to counter the effect of aging by reducing the appearance of wrinkles. Combined with sodium hyaluronate and niacinamide that provides natural moisturizing and firming effect which leaves the skin smooth and supple. Water, Propylene Glycol, Sodium Hyaluronate, Camellia Sinensis Leaf Extract, Cucumis Sativus (cucumber) fruit extract, Chamomilla Recutita Root Extract, Aloe Barbadensis Leaf Extract, Acrylates/C10-30 Alkyl Acrylate Crosspolymer, Phenoxyethanol, Caprylyl Gycol, Niacinamide, Malus Domestica Fruit Cell Culture, Xanthan Gum, Glycerin, Lechitin, Panthenol, 3-o-ethyl Ascorbic acid, Rosa Damascena Leaf Cell Extract, Allantoin, Salicylic Acid, Fragrance.